Annapurna Base Camp and Pun Hill Trekking, a scenic and cultural combination which leads you to enjoy both side of southern Annapurna Himalaya areas in perfect harmony of mountain views within traditional Gurung and Pun-Magar villages, surrounded by beautiful alpine woodland of tall rhododendron tree lines. Annapurna Base Camp-Pun Hill Trekking a fabulous walks on high green hills covered within enchanting forest with daily views of Annapurna Himalaya, as walk leads to high hills at Pun Hill for fantastic panorama of world highest peaks from Dhaulagiri-Annapurna to Manaslu range of mountains with array of lesser peaks. Adventure continues within rolling hills and ridge past traditional farm villages towards our next major destination to Annapurna Base Camp at 4,130 m high within picturesque Sanctuary enclosed within array of peaks. Starting our great adventure Annapurna Base Camp-Pun Hill Trekking taking a short drive from beautiful Pokhara one of the leading tourist destination in all Himalaya, a fascinating place where most of the treks and other adventure begins and ends on this scenic city at Pokhara blesses with natural beauty and wonders of mountains and lakes. As walk proceeds towards high hills into remote farm village and dense woodland of tall rhododendron trees, an amazing place regarded as worlds largest natural garden, in spring time the hills will be lively with various blooming wild flowers. At Ghorepani enjoy hike to Pun Hill with stunning sunrise views over chain of Himalayan peaks and then heading towards main highlight to Annapurna base camp and scenic sanctuary, where walk leads further north east from Pun Hill past large Gurung village of Chomrong and then following the raging Modi River right up to its glacial source at base camp. Trekking with grand views of landscapes and snow peaks to reach a wide plateau at Annapurna Sanctuary and base camp with mind-blowing panorama of massive Annapurna Himalaya in the comfort of nice cozy lodge, and then heading back to Pokhara on an alternative route with opportunity to soak into magnificent views of green rolling hills and mountain and observing local colorful culture of great interest. 1 Day 1: Arrival in Kathmandu and transfer to hotels.On reaching Kathmandu Tribhuwan International Airport where you will be warmly received by our guide and staff and then transfer you to your respective hotels in the hub of Kathmandu city. First check into your hotel rooms on getting refreshed from the flight and with Jet-Lag, then join with other members of Annapurna Base Camp - Pun Hill trekking for group briefing, where our expert guides will inform regarding your stay in Nepal, hotels, trekking, local lodge and overland drives with do’s and don’ts information, evening welcome group dinner in authentic Nepalese restaurants with Folk cultural programs to entertain you during your meals. 7 Day 7: Trek to Chomrong 1,951m- 06 hrs.Trek from Tadapani on downhill most of the way near to Kimrong Khola valley and past Gurjung village catching grand views of Annapurna peaks, as our route leads into forest of oaks and rhododendron with occasional view of the Annapurna. Walking on pleasant trail to Kimrong khola and then on uphill for few hours, once reaching at the top of the ridge the walk is fairly easy all the way to village of Chomrong the last village and the gateway towards Annapurna base camp and scenic sanctuary. 8 Day 8: Trek to Dovan 2,130m via Bamboo 2,050 m -06 hrs.From Chomrong our route leads past terraced farms then descend to Chomrong River, after crossing a bridge climb all the way for an hour or more to reach at Sinuwa Danda and a small village after this scenic spot on winding path into dense woodland with downhill for an hour to reach at a place called Bamboo, a small settlement with lodges in the middle of bamboo, rhododendron and oaks forest. After a brief stop an hour walk on gradual up brings you to overnight halt at Dovan, an isolated spot with few lodges, located in the midst of a forest near raging Modi River. 9 Day 9: Trek to Machapuchare Base Camp 3,720m via Deurali 3,350 m - 6 hrs.After Dovan, walk leads into cool forest with slow and gradual up following Modi River upstream, the trail continues with few ups and down to reach at Himalaya Hotel near huge Hinko cave, situated at beneath Hiunchuli peak. Himalaya Hotel is a small place with 2-3 lodges. 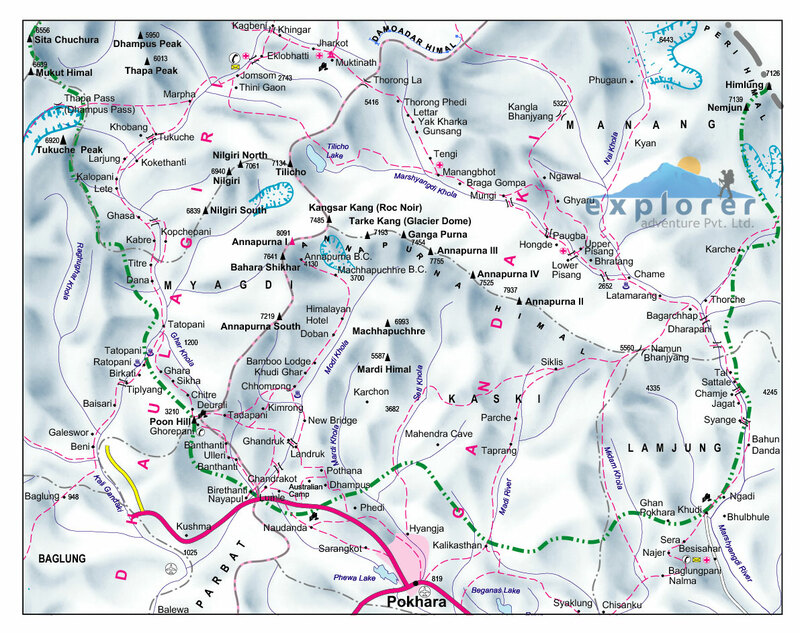 Continue walk with downhill and then up to Deurali the last tea-house and lodge before Machapuchare Base Camp. From Deurali where green vegetation and tree lines disappears for short alpine shrubs and bushes, as walk leads up to follow raging Modi River upstream, the track is quite pleasant with few strenuous climb for an hour in between and then reaching at Machapuchare Base Camp for overnight stop. Machapuchare base camp houses about five good lodges located beneath north face of Machapuchare Himal the Fish Tail peak. 10 Day 10: Trek to Annapurna Base Camp 4,130 m- 03 hrs.Today's heading to our main destination and highlight of the adventure as morning with short day walk leads you in the heart of the Sanctuary at Annapurna Base Camp, walk follows uphill for few hours, on grassy path, and then on pleasant path with magnificent view of snow peaks that surrounds you with massive Annapurna I, a great wall of a mountain slowly walk ends at Annapurna Base Camp the one and only place in all Himalaya with nice cozy Lodges at base camp, offering superb panorama. 11 Day 11: Trek to Bamboo 2,050 m - 06 hrs.After a wonderful time in complete tranquility within giant mountains and in serene wilderness our return journey leads back to lush green vegetation, as walk leads downhill with few ups to reach at Bamboo small settlement for overnight. 12 Day 12: Trek to Jhinu village 1,775 m - 06 hrs.Morning walk leaving behind Modi River and Bamboo areas with short ups and then on winding path into deep woodland to reach at Sinuwa danda with few houses and lodge, from here downhill to Chomrong River with climb to Chomrong village for possible lunch stop. From Chomrong a short climb and then descend on nice paved stone steps to reach at Jhinu village located on a high ridge and hill with super views of rolling hills and peaks, here with time to enjoy its hot natural spring which is 25 minutes walk downhill from the village by the bank of Modi River. 13 Day 13: Trek to Tolka 1,640 m via Landruk villages 1,460 m - 05 hrs.Catching views of Annapurna peaks, morning walk leads on pleasant trail into cool shade of woodland with downhill to reach at New Bridge, and then crossing a long suspension bridge with nice moderate walks and then a short climb up to large Landruk village. After a refreshing break carry on trekking where walks gets gentle on winding trail with short uphill to reach at Tolka for overnight stop with views of Annapurna South and Huinchuli peaks. 14 Day 14: Trek to Dhampus 1,530 m (04 hrs) then drive back to Pokhara 860 m - 01 hr.Our last day walk leads through farm fields and small villages of Bheda Kharka on gradual winding path and then a climb for an hour to Pritam Deurali hill top with views of Annapurna and Dhaulagiri facing dramatic scenery of landscapes and then ending our final trek with downhill to Potana and then reaching at Dhampus village, a scenic spot situated on a high ridge offering panorama of snow capped mountain range, from here our walks concludes with a short drive back to picturesque Pokhara by the Phewa lake side. 16 Day 16: Depart for international flight home ward bound or to respective countries.Your last memorable day in Nepal after a wonderful experience on Annapurna Base Camp and Pun Hill trekking with great service of Explorer Adventure, and as per your international flight then transfer to Kathmandu international airport for homeward bound or to your respective destinations. In all your arrival and departure private transportation provided. Nepal entry visa-personal travel and medical insurances.